Recently Jokowi announced an end to the restrictions on foreign journalists reporting in Papua, Indonesia. This was rightly heralded as major news, “good place for Jokowi to start” (in Ross Tapsell’s words) in making some lasting changes to the sorry situation of Indonesian Papua. But sadly, no so fast. Here is Coordinating Minister for Political, Legal and Security Affairs Tedjo Edhy Purdijatno on the security risks that foreign reporters present. There are two groups of foreign journalists. Those who are sincere, they can go around Papua no matter what. There are also those who bring their own interests. Those who bring their own interests, these are the ones that we have to be vigilant against. The intelligence services will monitor them. Ah, tertentu. My handy Echols and Shadily glosses this word as “someone or something specific but unnamed,” which is just exactly right. The phrase carries heavy baggage from the New Order era, as the phrases kepentingan tertentu (unnamed specific interests) and pihak tertentu (unnamed specific forces or groups) were frequently used to signal a kind of ominous general threat to order and security. As in, who’s speculating against the rupiah? Pihak tertentu. Why would they have tried to launch a coup? Kepentingan tertentu. Who wants reform? Pihak tertentu. And so what might motivate those journalists to report faithfully on local politics in Papua? Kepentingan tertentu. Indonesian politics rule number one: beware of the kepentingan tertentu of the pihak tertentu. 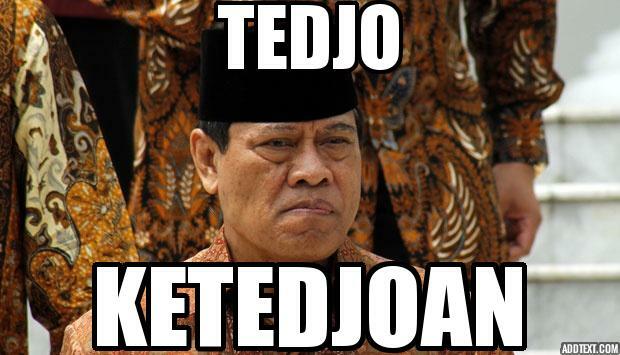 Rule number two: Tedjo’s gonna be Tedjo.